On February 2, 2014, 26-year-old Russell Carrington Wilson led the Seattle Seahawks football team to a Superbowl Championship over the Denver (Colorado) Broncos in Superbowl XLVIII. Wilson, in only his second year with the Seahawks, became the second African American quarterback (after Doug Williams) to lead his team to victory in the annual National Football League (NFL) championship game. He was also the quarterback who led the Seahawks to their first Superbowl win in the team’s 38 year history. Russell C. Wilson was born November 29, 1988 in Cincinnati, Ohio to Harrison Benjamin Wilson III, an attorney, and Tammy T. Wilson, a legal nurse consultant. He has two siblings: Harrison IV and Anna. Wilson started playing football at the age of four, encouraged by his father who had been a standout college player at Dartmouth College and who briefly played in the NFL preseason with the San Diego (California) Chargers in 1980. Benjamin Wilson III died on June 9, 2010 at age 55 due to complications from diabetes. Wilson’s grandfather, Harrison Benjamin Wilson Jr., was an honor roll student and standout athlete at Kentucky State University and later basketball coach (1951-1960) at Jackson State University. He is best known as the second president of Norfolk State University from 1975 to 1997. Russell Wilson grew up in Richmond, Virginia and attended Collegiate, a prep school in the city. While there he played on the varsity football team in his junior and senior years. As a senior in 2006 he led Collegiate to the state championship. His performance drew the attention of Sports Illustrated which wrote about him. Wilson was also a standout academically and served as senior class president at Collegiate. Wilson played college football first at North Carolina State University where in his freshman year (2008) he was named first team All-ACC quarterback, a first for a freshman quarterback. In the 2009 season he led the NC State Wolfpack to a 9-4 season. In May 2010 Wilson graduated in three years from North Carolina State University with a B.A. degree in communication and in the autumn of that year took graduate-level business courses. With one year of football eligibility left, Wilson joined the University of Wisconsin Badgers football team in the summer of 2011. Later that year he led the Badgers to the Big Ten Championship and the Rose Bowl. The Badgers however lost the game 45 to 38 to the Oregon Ducks. Wilson also flirted with a professional baseball career, playing in 2009 with the Gastonia (North Carolina) Grizzlies. On June 8, 2010, he was drafted by the Colorado Rockies in the fourth round and played second base with one of its farm teams. Although he returned to college football, Wilson’s baseball contract was acquiredfrom the Rockies by the Texas Rangers on December 12, 2013. Although most scouts concluded Wilson would be an ineffective NFL quarterback because of his 5’11” height, the Seattle Seahawks signed him in the third round of the 2012 NFL Draft. Wilson accepted a four-year, $2.99 million contract on May 7, 2012, and was named the team’s starting quarterback on August 26, 2012. In his rookie year Wilson guided the Seahawks to the postseason playoffs where he led the team over the Washington Redskins in a 24-14 comeback victory. In the next playoff game, the Seahawks fell to the Atlanta (Georgia) Falcons, 30-28. Wilson boldly encouraged his teammates at the beginning of his second season, saying “Why not us [in the Superbowl].” Although few believed that possible in September, over the season, he led the Seahawks to a 13-3 record. On January 19, 2014, Wilson and the Seahawks defeated the San Francisco 49ers in the NFC Championship Game, 23–17, sending the Seahawks to Super Bowl XLVIII. There he threw for 206 yards, two touchdowns, and no interceptions in a 43-8 upset win over the Denver Broncos. Wilson led his team to Superbowl victory as the lowest paid starting quarterback in the NFL. On January 14, 2012, Wilson, a devout Christian, married his long-time girlfriend Ashton Meem in Richmond, Virginia. Ken Tysiac, “Father’s Dream Inspires Pack’s Wilson,” The Raleigh News and Observer, August 22, 2010; Danny O’Neil, “Russell Wilson’s Rise to NFL Starter no Surprise for Those Who Know Him,” Seattle Times, http://seattletimes.com/html/seahawks/2019088051_seahawks07.html; Arlene Hamilton Stewart, “I Do, I Do: Ashton Meem + Russell Wilson,” Richmond Times Dispatch, April 8, 2012; Dexter Rogers, “Russell Wilson Becomes Second African-American QB to Win Superbowl,” http://www.huffingtonpost.com/dexter-rogers/russell-wilson-becomes-se_b_4719940.html. 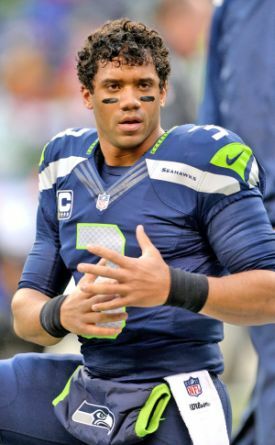 Second African-American QB to Win Superbowl,” http://www.huffingtonpost.com/dexter-rogers/russell-wilson-becomes-se_b_4719940.html.